It’s a good time of year, with the off-peak return of some of my top television shows. As much as that gives me delight, there is a ringing in my head I can’t get rid of; one that threatens my ability to enjoy this quality entertainment viewing. It comes in the name of Jimmy Fallon. Jimmy has been able to submarine the concept of entertaining television, be it late-night or any other time of the day for that matter. Somehow this toolshed made a career out of destroying Saturday Night Live, then becoming the most notriously aweful host of an awards show ever, only to then go on and make a few crappy movies about the Red Sox. If it isn’t bad enough, the Red Sox actually decided to WIN the World Series that year, throwing a a monkey wrench into his plotline. What does he do then? He completely changes the ending of the film without touching any of the rest of the plot! Brilliant filmmaking, I know. 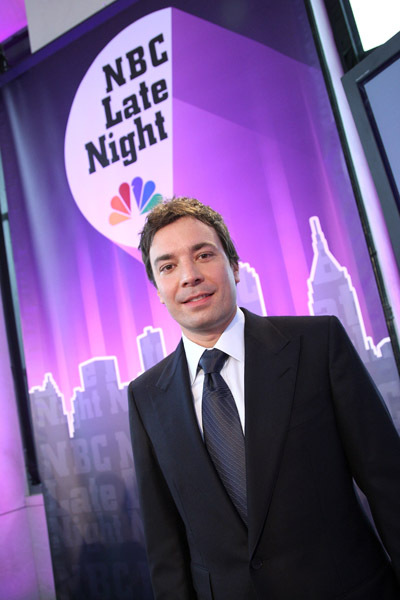 As much as I love ripping on Fallon, he deserves every bit of it. I never thought I would long for the comedic talent not seen since the days of The Magic Johnson Hour. Fallon’s shortcomings are a-plenty, but let’s just say I’ve seen better comedic timing from a monkey. After watching his show the other night, I realized I haven’t been that uncomfortable watching TV since Jim Grey interviewed Pete Rose at the All-Star game. Fallon’s interview skills rank right up there with Joaquin Phoenix’s rap skills. I mean seriously, Gary Busey can carry on a better dialogue with guests than Jimmy Fallon can. Celebrity Apprentice: Joan and Melissa Rivers are quacks, and Annie Duke is a lowdown scumbag. Who could blame Rodman and Tom Green for getting hammered every day? I never thought Khloe Kardashian would come out looking like the most stable of the lot. American Idol: If that dude Adam wins I swear to you I will never watch the show again. I tell you he reminds me of how Marky Mark screached through the Steel Dragon ballads in Rock Star. Danny deserved to be the winner since Day 1. Resuce Me: Once again the best show on telelvision has finally returned. It was a long layoff, but it won’t take long to get right back into Tommy Gavin’s convoluted mindframe. Women loathe him and guys want to be him. 24: The show officially jumped the shark. I bailed halfway through the season after they recycled a plot from an earlier season (the chemical plant contamination) AND blatantly ripped off Die Hard 2 by taking control of an air traffic control center. Maybe they should have gone through the Annex Skywalk (“It’s a bottle neck…they’re sitting ducks!”). Of course, this was all before Keifer pulled a real-life Jack Bauer and head-butted some clown in the bridge of the nose. Now, there is absolutely no reason to keep watching 24, especially since we get to see Jack in real life! Southland: What a great new show. I got hooked right into it from the start. I can almost forget that the lead is Ryan from The OC. The Office: The season finale is coming up, and while it wasn’t the greatest season ever, it did produce some classic moments. It is easilt the best comedy on television and I hope it can keep it up.